Looks like a 737-400. 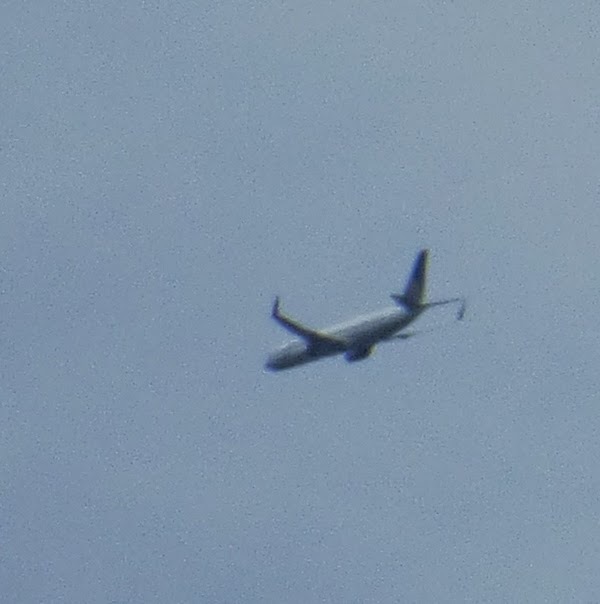 From the livery (paint scheme) on the tail, it appears to be Continental Airlines. The vertical winglets on the wingtips have been common for about the last 10 or so years, they are even seen on some 747 aircraft. It looks like a Boeing 737 with winglets. A fairly new, but common jet. My husband says a 777 jet. I don't know what that plane is, but the "upswept" or "uptilted" wing segments are called winglets. Many kinds of planes use them in some form or other. They are called winglets. Many planes have them including the Boeing 737. Not sure about the aircraft. However, there are companies like Pictometry who fly 72 aircraft 365 days per year taking pictures of the US. They then sell their software licensing and image mapping to tax appraisal districts, utility companies, oil/gas companies, insurance companies, etc. It is different imagery than satellite. I think their planes are manned, not drones. Looks like a 737 to me. The upturned wings are called winglets. They improve the efficiency of the wing, which improves fuel efficiency and reduces turbulence. At lower speeds it increases lift and stability of the wing without increasing the length of the wing. I agree with other posters, it looks like a 737 or another plane of similar size. Many of the smaller planes have that type of wing now and its hard to tell the color scheme of the plane, but it looks like it is Continental Airlines like another poster said. When I flew to the east coast a couple years ago out of Boise, my flight to San Francisco and then on the return trip to Boise was on a plane with wings like that, don't remember the type of plane it was, but it wasn't a Boeing. 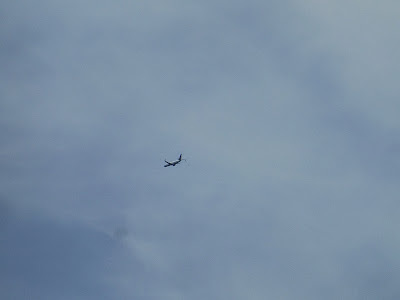 I will say though where I live is on a major east/west US flyway and also on the flyway from San Francisco/LAX to Europe flyway so I see planes fly over all day long and those planes are really quite common to see fly over. Some jets are super loud, others are pretty quiet, the newer planes tend to be more quiet. Now if you ever get a chance to see an Airbus A380 in the air, they are amazing to see fly, they are so massive and yet much quieter than a 747 or 777. I see the California to Europe and back flights at least a couple times a week and they amaze me all the time. We also have drones flying over all the time, they train some drone pilots out of Mtn. Home AFB so we get to see them all the time. Now they are completely quiet, so those you don't hear at all, you just happen to look up and see one. In case anyone cares, the purpose of the winglets is to prevent air from spilling off the tip of the wing, which causes a vortex. The winglet keeps airflow across the ailerons to help in roll control and to help prevent stalls at lower speeds. Looks like a jet engine under the wing. And I agree with a previous poster that the livery appears to be Continental. I'm an engineer and I fly a lot for my job. This type of winglet is more common than not on most modern planes these days. They reduce wing tip vortices, which helps fuel economy by reducing wing tip drag. The angled tip design also helps roll stability.